Photolalia: The New California Barber Shop -- Some images... and a few brief words about them. (Oakland, 2002. Image copyright Hamish Reid). The New California Barber Shop and The House Of God Spiritual Temple, Dogtown, Oakland. 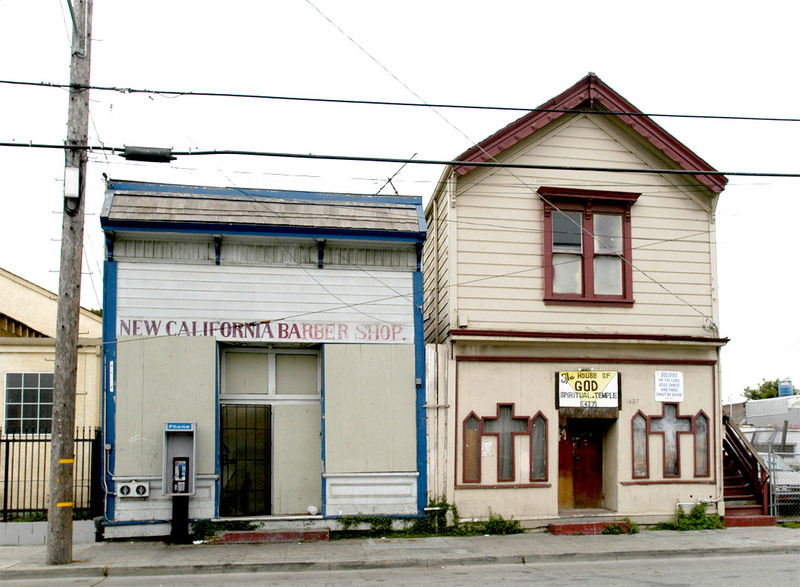 Two of my fave Oakland buildings, in what was once one of the rougher neighbourhoods (Dogtown) of a rough city (Oakland). I've always liked the colours, the window shapes, and the confusing geometry of this scene. Plus, of course, this is a part of town that's got a lot of associations for me going back nearly two decades. The two buildings are still there, both completely derelict now, but since Dogtown's being increasingly overrun by redevelopment, it's not clear how much longer these two will be around, at least in this form. It's the old story, no? (And one of the reasons I'll probably soon have to leave my own neighbourhood, which has also been transformed from a low-rent industrial area to, gawd help me, an arts district with a growing rash of hipster cafes, lofts, and galleries insinuated into the poorer bits). But Dogtown's different from my neighbourhood: few people were displaced when the factories around my current studio closed down or the businesses moved to the Valley or overseas; we (mostly) moved into empty buildings and dead blocks. In sad contrast, Dogtown was always a small residential oasis. It's still got a lot of the original inhabitants, increasingly semi-homeless or on the street after being evicted or expelled from homes some of them have lived in for decades, mostly just to make way for nice middle class condos and lifestyle lofts; the class-based version of ethnic cleansing, I guess ("class cleansing"?). The same as it ever was. And it's a mistake to be nostalgic for some sort of urban authenticity or to overlook the reality of a place like this: yes, it's scenic; yes, it's picturesque; yes, the colours and shapes totter between the naive and the inspired; but yes, too, it was then, and still is, a site of extreme desperation for a few. One of the reasons it actually took me forever to get this shot  literally weeks of on-and-off prowling  is that there's a steady stream of homeless and derelict people who congregate in front of these two buildings on their way to or from the local recycling center (where they can unload their trolleys of stolen recycling for a few bucks) or to drink or drug themselves into a state of anesthesia on the street right here. Since I really don't enjoy making art of real people's misfortune, I didn't want to include suffering and personal decrepitude, no matter how it would "improve" the shot for a lot of viewers.